On any given day, I imagine myself basking in the sun on a rooftop in Santorini overlooking the Aegean Sea…sipping on a fabulous glass of wine, and snacking on warm, freshly baked pita bread with fresh olive oil, kalamata olives, feta cheese and Tzatziki sauce… naturally I’m thin, wearing a designer bikini (with a less-than-there cover up), large “movie-star” sunglasses and a wide-brimmed designer hat–all while sporting a tan only the maker’s of Ban de Soleil could provide. oh. but wait…I’m not there. I’m in my robe, researching Tzatziki sauce. Wishing I were in Greece. 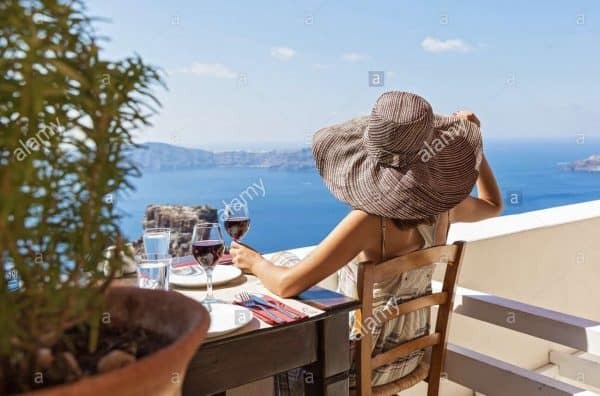 In any case, I’ve never been to Greece and while it is on my bucket list, I must improvise until I get there, so I make Tzatziki sauce and daydream. 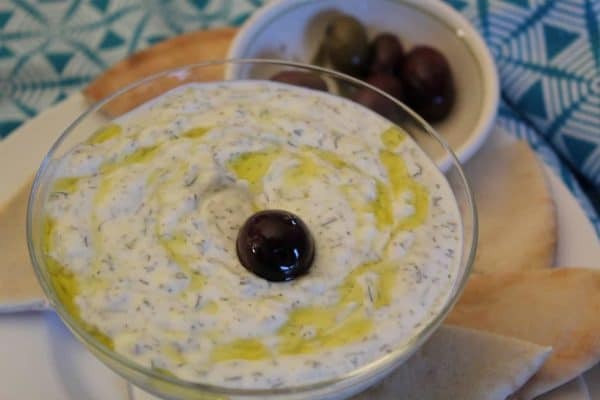 Tzatziki sauce, “tsatˈzi´ːkee”, is a yogurt based sauce/dip that contains cucumber, garlic, dill, sometimes mint, often found in Greek and/or Greek-American restaurants. It’s commonly presented as an appetizer, served with dolmas, pita, Gyros or calamari, or with skewered lamb, or chicken. 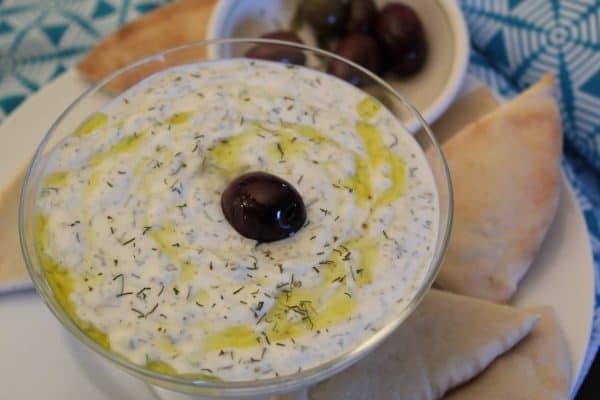 Do I Have to Use Greek Yogurt for Tzatziki Sauce? Greek yogurt is strained more than conventional yogurt, making it a thicker consistency. I’ve made this recipe with non-Greek yogurt and it didn’t turn out so well. Greek yogurt is the best choice. 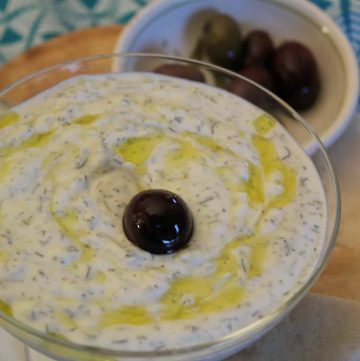 This dip/sauce works great with pita bread, but consider dipping bell peppers, carrots, celery of kalamata olives in the Tzatziki sauce, particularly if you’re trying to cut back on carbs! Should I Use Fresh or Dried Dill? Either fresh or dried dill can be used in this sauce, but keep in mind that dried herbs are more potent than fresh. If you want to substitute one tablespoon of dried dill with fresh, then you would use 3 tablespoons of fresh dill. Creamy and tangy yogurt sauce with hints of cucumber, garlic and dill. This recipe uses dried dill; however, if you use fresh dill, you may need to use more because dried herbs are stronger and more potent than fresh. No vinegar? Add a squeeze of fresh lemon juice instead! Pushing back on the carbs? Try this delicious sauce with sliced red, yellow or green bell peppers, carrots, celery or kalamata olives! 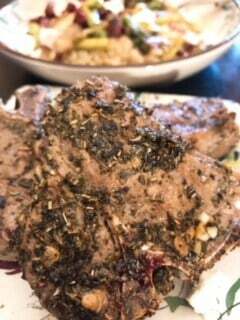 If you’re going for a Greek-themed dinner, you might like Mediterranean Lamb Loins!